It’s so nice to see my boys just be boys. As they grow up some things become “uncool” Last night Cody decided he wanted to go out into the new snow and build a snow fort. He has not “played” in the snow since he started high school. Soon enough he was calling for Benjamin to come out and play with him. The two of them were outside for about 2 hours making forts and having snowball fights … I predicted it was only a matter of time before the big one makes the little one cry but I enjoyed watching them while the gettin’ was good. I called down to see if they were getting hungry yet, Cody asked what was for dinner, I told him Soup and toasted tomato sandwiches… Benjamin looked up and asked me if I’m going to actually toast the tomato? And yes, there were tears in the end… whoa is me. 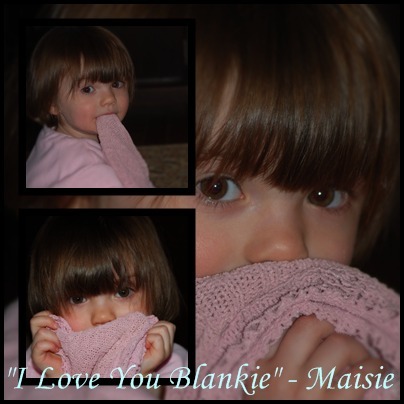 Comfort comes from different things for different people… For Maisie, comfort comes from her “Blankie” Blankie has had to be cut in two so that Maisie’s mom can make sure it’s washed daily. It’s been a while since I visited. Between work and a small surgery time just got away from me. Every time I sat to write an entry only 1/2 of what I wanted to say would come out… the rest just jumbles in my head and I wonder why I even bother. 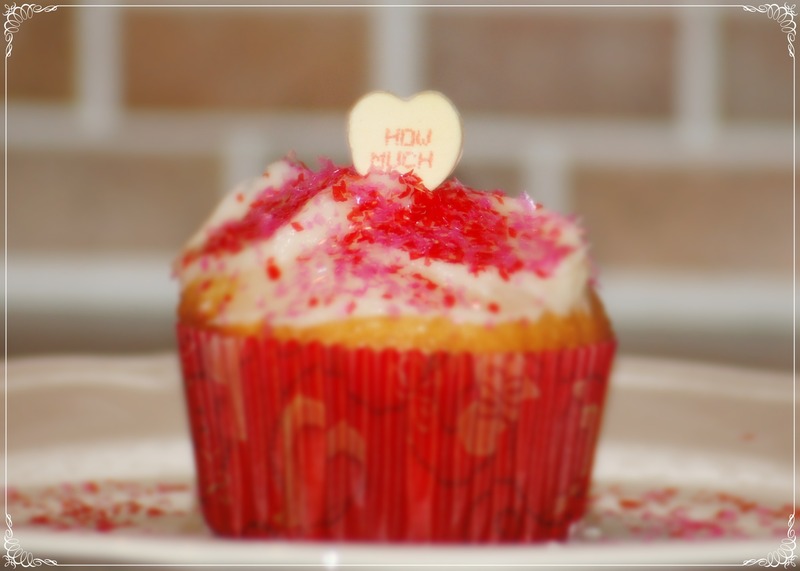 At this moment I’m beginning to wonder if blogging is just my way of talking to myself? I have had a topic for a blog entry on my mind for some time now but I”m afraid to put it down on paper computer. I’m afraid of the curse it might bring. After weighing both sides I have decided to go ahead. The topic is Secondary infertility. In my mind there are three infertility categories, the first is Primary Infertility, this is when a couple cannot conceive any children without medical intervention. Secondary infertility is when a couple has had children however now cannot due to natural circumstances. I fall into what I believe is the third category…. Self inflicted Secondary Infertility. I’m not sure if this is a real term but it’s my way of describing our situation. It’s also a the reason I don’t look for sympathy. I want to first start out by saying that none of my children were accidents or EVER unwanted. 12 years ago after the birth of my second son, my husband and I (still in our early 20’s) decided that financially we couldn’t even consider having another child. Being as young as we were we couldn’t see the light at the end of the tunnel… we were barely making mortgage payments, I went back to work when the baby was only 2 months old to help make ends meet….we were working like crazy and we were physically and emotionally exhausted. This kind of stress on a marriage is not good. Having another child was the furthest thing from our minds so to prevent further setbacks my husband had a vasectomy. That sentence seems so final because it is described by doctors as a permanent birth control solution…. words like “irreversible” were used. We didn’t give any thought to what we had done until the clouds started to part. With some additional education the job I went to turned into a very well paying career, my husbands construction job evolved into a union position. All the struggles we went through strengthened our relationship. Instead of growing apart during the rough patches, my husband and I grew together and together, we raised beautiful little men. I don’t regret any of our decisions because I believe they made our family what it is. For the past 10 years we knew our family was not complete. For the past 7 years we have been praying for a miracle every month. For the past 5 years we have been discussing our options. There was a lot of uncertainty and for most of it, we felt beat. It wasn’t until I found a wonderful support group online that the options we had been discussing finally started to seem possible. For the past year and a half we have been trying to conceive with the help of fertility treatments. There are very few people who know what we are doing but some of the people that do know are curious … “Why the heck are we doing this?“. Why when we have 2 healthy happy boys (out of diapers and almost completely independent I might add!) would we want to go back…. to them it doesn’t make sense. Here’s the answer…we don’t see it as going back, we see it as taking a step forward with our family. We now know that an opportunity to have another baby will not mean we are taking love away from each other but rather it’s another opportunity to grow together and that’s good! We know what it’s like to hear our babies first cry, watch our babies sleep, hear them say “I love you”. We also know that having another child means we can’t just up and go grocery shopping when it’s convenient and it could mean pasta 3 nights in a row and going back to mismatched socks. We know that it will mean doing things all over again and that’s another reason we are doing this… we want to. There it is, I”m out with it. I didn’t keep this private because I think there is anything wrong with our decision, I have kept it private because I’m afraid of failing. I’m afraid that if 3 years from now there is still not baby people are going to look at us with pitty. I’m heading into a new cycle this month. Unfortunately, I’m 99% sure it will be cancelled as I think I have a cyst on my ovary but I’m already making plans for the next and the next and the next… At this point I have faith that it will work and no one will have to look at us with pitty. Why oh Why do I do this to myself?!?!?! Today is not a weight watchers day. Tomorrow I’ll get up early and work it off, I swear! 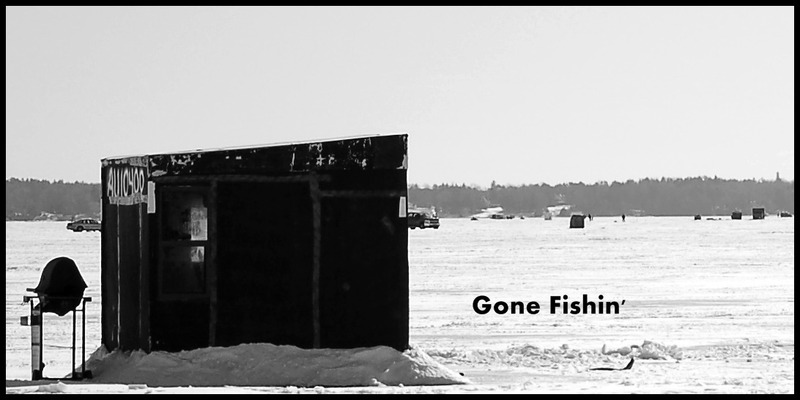 Today we spent the day ice fishing. Not that we caught any fish but in all honesty, that’s not why I went anyway. Spending time together… just the 4 of us in the middle of a frozen lake was perfect and after a particularity stressful week, well deserved. Family outings are not what they used to be. It used to be that when we went grocery shopping, we all went together. While the grocery store is not really quality family time, no matter where we go or what we are doing there are always plenty of bonding moments that occur. I like having the boys with us… I like their company. Now that they are in their teens, we find that they tend to prefer to stay home during day to day trips and unless we plan something special, hubby and I have a lot of alone time. I’m not complaining about that either! When the boys were around 10 or 11 I started realizing that it would only be a few years until we were going to be in this position… I saw this coming and I’m not thrilled the time has arrived.